Over 10,000 youth are on the Scouting trail with high quality programs in our 37 communities. With your support through Friends of Scouting, we provide fun, challenging programs for Scouts of every age. To support our mission, our Board of Directors sets an annual operating budget of $3.4 million. 83 cents of every dollar raised is invested in direct programs and services for our Scouts. The budget works out to about $360 per family. 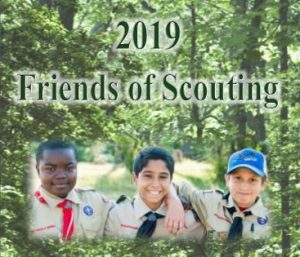 Friends of Scouting provides you the opportunity to significantly help offset the cost of the programs and services provided locally with a tax deductible contribution. The Connecticut Yankee Council is a 501(c)(3) charitable organization that relies on local contributions. Your employer may match support for Scouting. Contact your human resources department to have your gift matched. These are all the printed materials in the presentation packet. For additional materials (patches, pledge cards, pens, and ribbons) please contact Support@ctyankee.org or your District Executive.